Cydia keeps bringing us more and more ideas to our iPhones, as reminders for messages that we saw a couple days ago. Today we bring you one of those modifications that are essential every time you make a new jailbreak, those who remain forever in your iPhone. If you send a lot of pictures for iMessage, Facebook, WhatsApp, Mail, Twitter, etc. QuickPhoto will love it, as it makes the job much easier. 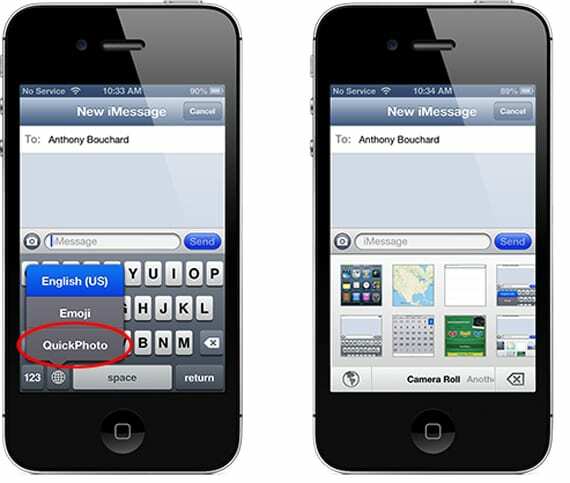 QuickPhoto is integrated into the keyboard, like a new language, to enable us to quickly select photos and send them. We just have to select the options QuickPhoto keyboards and displayed the latest photos taken, just select the one you want and send. Furthermore QuickPhoto is compatible not only with your reel, also with photos streaming or other album you have created. You can scroll horizontally between your photos and use the Delete button to delete photos you've accidentally attached. To return to normal keyboard just click the balloon again. The device you send it need not jailbreak to receive it, or modification installed. You can zoom in on the photos leaving them down for several seconds and so you can be sure not to send the wrong photo. The good thing about this change is that you can send a photo after another without using the normal options, which is much faster. You can download it for $ 3.99 in Cydia (within a few days will cost $ 4.99), you'll find it in the BigBoss repo. You need to have done the jailbreak on your device. Article QuickPhoto: Add photos of the easiest (Cydia) was originally published in News iPhone .